Replacement windows, doors, conservatories and roofline can often mean more than simple renovation of your property . This is often not the case; there is a lot of variations house construction design and individual requirements that can involve building work, joinery, plastering, plumbing, roofing and electrical work. In our extensive experience we have completed many different variations of this work to ensure you can get the finished installation you require. A popular alteration to the rear elevation of a property is to turn a flat window into a patio door. If you intend to keep the existing width of the frame and just remove the brickwork below this is quite a straightforward installation. The external walls are cut out, the internal walls removed by hand, the new internal reveals are plastered and a new tread board is fitted. When patio doors are fitted radiators often need to be re-sited or capped off, sometimes plug points need moving too. Making the aperture wider becomes a slightly more complicated installation. This involves installing a new lintel, either catnic or concrete lintels are used depending on the installation. 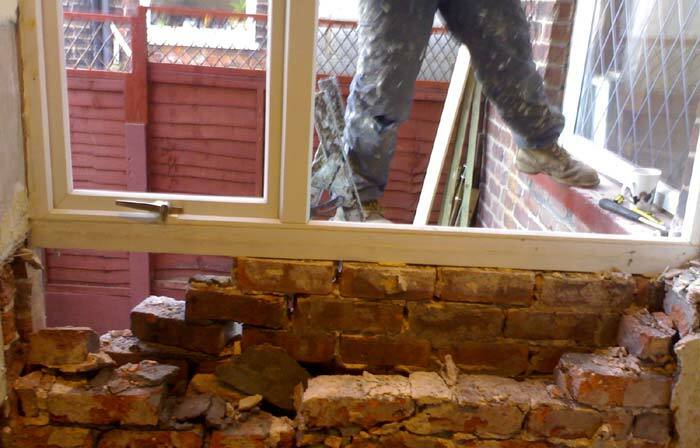 Windows and doors are often reduced in size, such as blocking a door up in the kitchen or to give a brick pillar to build a new conservatory from. No problem! A6 windows can also provide solutions for non standard window shapes. You can have any sort of design including every type of round or square bays, to bow windows conversions providing a pleasing curved alternative to traditional flat frames. You can even have special shapes too – like round or circular windows, triangular shapes and every style of arch.